‘Crunch’ transfer meeting set to take place at St James’ Park over the next 48 hours – Report – NUFC blog – Newcastle United blog – NUFC Fixtures, News and Forum. A series of ‘crunch meetings‘ are set to take place on Tyneside this weekend according to the Chronicle, with Benitez, Charnley and chief scouts set to discuss the club’s recruitment plans for the upcoming transfer window. We all know what Rafa wants, he has been clear on that – more investment in the academy, improvements to the training ground, as well as a competitive transfer budget. The latter is of course crucial to Newcastle being able to move back into the upper echelons of the top flight, where Benitez wants to be. ‘Newcastle United chiefs will hold a crunch meeting this weekend to discuss recruitment for the next window. ‘The conference will include discussions on targets that have been scouted over the winter periods after talent spotting missions to Spain, Italy, France, Belgium, Holland and further afield in eastern Europe. ‘United have been linked with Brazilian striker Joelinton of Hoffenheim in recent months and a more concrete list of targets is yet to be whittled down. 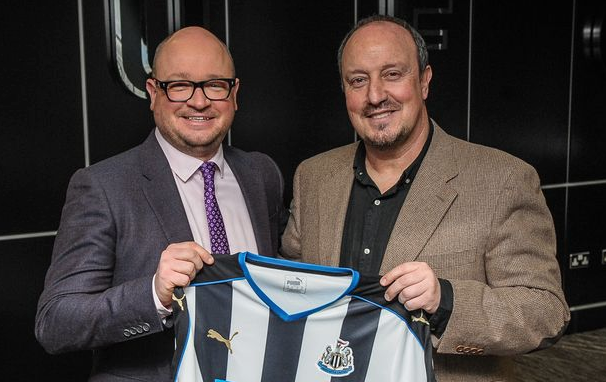 ‘Rafa Benitez is expected to attend along with managing director Lee Charnley, head of recruitment Steve Nickson, European scout Paul Baker and senior scout Mick Tait. ‘The meetings are expected to take place at St James’ Park and the training ground over the weekend. ‘United hold regular scouting meetings across the season and this get-together was always in the diary for United chiefs. ‘But there are certain to be some hints on Benitez’s future within the meeting as summer targets are discussed as well as the planned changes that lie ahead for the club’s Academy. Benitez will want cast iron assurances on where Newcastle are going before committing on his future, not the half baked promises that he has heard before. He has not been backed in any transfer window since we have been promoted; you can argue the Almiron signing was just using part of the Mitrovic money from last summer. It is worth remembering even with our new record singing, the net spend since Benitez took over is at zero. Targeting players is one thing Newcastle seem to be very good at, but paying the money required certainly isn’t. This summer we don’t want another Lacazette who we won’t invest in like we did a few years ago, leaving us looking back at what might have been. If we are serious about keeping Benitez now is finally the time to prove it. Crunch talks means they are sweeping up the peanut shells to see how much they can sell them for to determine the transfer budget.